The 14th Annual Rosenzweig Report Shows a Continued Gap. 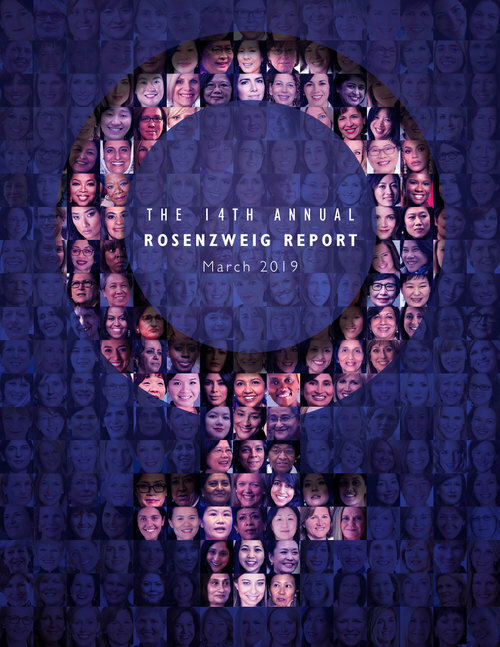 NEW YORK, March 8, 2019 – Though there has been some positive progress regarding the state of women in top corporate jobs in the United States and Canada, findings from the 14th Annual Rosenzweig Report indicate that women continue to be held back. Indeed, the latest edition of this benchmark analysis of Canada’s 100 largest public traded companies reveals an increase of only two women CEOs since the talent acquisition firm published its first report in 2006. This marginal growth is further reflected in the slight increase in the number of female Named Executive Officers in this latest report. Of 532 NEOs in Canada, 53 are women, representing 9.96 per cent of all executive positions. The year prior, this number stood at 9.44 per cent. “Progress can only be described as incremental. To put it in perspective, at this rate it will be at least 2040 before women will occupy even 30 per cent of these jobs. Today’s millennial generation will be approaching retirement,” said Jay Rosenzweig, Managing Partner of Rosenzweig & Company. In fact, in some measures, the report reveals that women’s roles in some sectors is retreating, as only three female CEOs remain among Canada’s top 100 companies — half the number of the previous year. No female CEOs are found among Canada’s 25 largest corporations. Surveys of Fortune 500 companies in the United States have also noted a decline in the number of women CEOs. Rosenzweig noted that these latest findings illustrate the need for more proactive measures for promoting leadership opportunities for women among Canada’s top businesses. “While I have never advocated strict quotas as a solution, I do think corporate boards need to step up their efforts to expand the pipeline of CEO role-ready women as part of their succession planning mandate,” he said. Other business leaders are quick to agree with these sentiments. “It’s time for companies to realize that a corporate ladder designed entirely to suit men with stay-at-home-wives is not a ladder, it’s a strainer that will lose you a lot of great talent,” said Nathalie Molina Niño, founder of Brava Investments and author of Leapfrog, The New Revolution For Women Entrepreneurs. Many are quick to cite the work of the Rosenzweig Report as a crucial element of helping companies better understand the need for a change that is already affecting many different aspects of society. “Women are the backbone of a progressive society, and yet it is so hard to be a woman, especially a woman of color. While it is difficult, we see women stepping up everywhere,” said Van Jones, social entrepreneur, CNN political contributor and CEO of the REFORM Alliance. Other studies have consistently backed up the value of prioritizing women in NEO positions. For example, a Harvard Business Review study of 22,000 global firms found that companies with women in 30 per cent of NEO positions experienced an average 15 per cent profitability increase in comparison to companies without any women in C-suite positions. Of the 532 Named Executive Officers (NEOs), 479 are men and 53 are women. The net number of women increased by two. In percentage terms, women now hold 9.96% of these important jobs compared to 9.44% a year ago and only 4.62% in 2006, when the study began. Of the 100 largest companies, 42 have at least one woman in a top leadership role, up 2 from the previous year. In the 25 largest companies, there are now 11 female NEOs, unchanged from the previous year. In the corner office, there are three women CEOs, down three from the previous year. Rosenzweig & Company is a global leader in talent acquisition, executive search, and emerging tech advisory.